Offering you a complete choice of products which include rafoxanide oral suspension 3.75% w/v and rafoxanide and fenbendazole oral suspension. 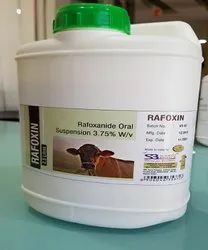 Rafoxanide is a halogenated salicylanilide, it is highly effective in cases of facsioliasis&haemonchiasis and is mainly indicated for the treatment of acute and chronic liver flukes infestation in sheep and cattle. Rafoxanide suspension is a highly effective remedy for treatment and control of adult and immature liver flukes (Fasciola hepatica and fasciolagigantica more than 6 weeks). All strains of adults and immature flukes, and all larval stages of the sheep nasal warm. Rafoxanide suspension is used in the treatment and control of adult and immature liver flukes (Fosciolagigentica, and fasciola hepatica (more than 6 weeks) and adult worms of Haemenchus species. RAFOXIN Suspension should be taken orally. The dose is given orally without dilution and can be repeated 4 – 6 weeks later or as prescribed by the veterinarian. The recommended doses range from 5 to 15 mg/kg rafoxanide is generally administered by oral route by gavage and/or by the intraruminal route. However, rafoxanide can also be used at a dose of 3 mg/kg by subcutaneous route, but this therapeutic regimen and this administration route are not defended in thissubmission. Rafoxanide had no effects up to a single administration of 100 mg/kg administered by intraduodenal route in dogs on the cardiovascular and respiratory systems or by oral route in mice on the locomotion activity, on hexobarbital sleeping time and on the intestinal motility (charcoal propulsion test). In rats, a single oral dose of 10 mg/kg of rafoxanide did not induce adverse effects on urine output and urinary electrolytes. In another in vivotest in rats to study the influence of rafoxanide on blood coagulation, no effects were reported on the prothrombin time test and activated partial thromboplastin time up to 30 and 100 mg/kg respectively. STORAGE:Store in cool dark place, below 25°C. Protect from light. Keep container tightly closed when not in use. For oral administration in cattle and sheep. For sheep, the recommended therapeutic dose is 7.5 mg fenbendazole and 7.5 mg rafoxanide per kilogram bodyweight. 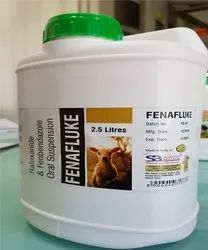 For cattle, the recommended therapeutic dose is 11.25 mg fenbendazole and 11.25 mg rafoxanide per kilogram bodyweight. Shake well before use Estimate bodyweight carefully. Use only properly calibrated dosing equipment. At 2 months after housing, when dosing cattle for worms and adult fluke, a lowerdose of 7.5 mg/kg can be used i.e. 7.5 ml per 50 kg bodyweight, 30ml per 200 kg or 75 ml per 500 kg. CATEGORY: Anthelmintic for Cattles, sheep and goats.